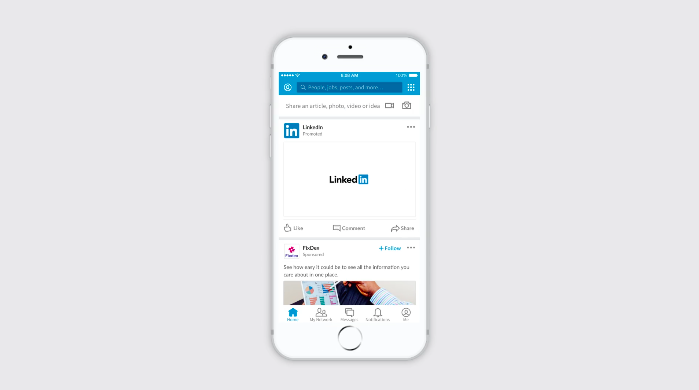 LinkedIn has come a long way since its humble beginnings as a professional networking site back in 2003 — it’s now the go-to social platform for all things business communication. Hoping to read up on the latest trends in your industry? LinkedIn’s got you covered. Want to connect with that former colleague of yours from a few cubicles over? We bet you’ll find them on LinkedIn! And while the platform may have been slow to jump on the video bandwagon, now that members can finally upload videos natively, it’s time to put on that strategic hat and think about how your business can get the most out of this channel. Unlike Facebook, Instagram, or even Twitter, LinkedIn’s user baser is made up of business-minded, decision-makers who may have significant buying power at their business, so it’s important to keep that in mind when crafting your strategy. Before we get into some ideas for the content you can create and best practices for making your video shine, let’s dig into how marketers and salespeople alike can start leveraging this channel today. Back in August of 2017, LinkedIn gave members the ability to upload videos natively to their platform. Since then, they’ve introduced video ads and have even added the ability to upload captions. It’s pretty clear that LinkedIn is taking a page from Facebook’s book, so you can safely assume that more video-centric features will continue to crop up over the next few years. So, what does this mean for marketers and salespeople who are always looking for new ways to interact and engage with their audience? One obvious plus is that you’re more likely to reach the audience you’re looking for on this channel. Certain types of business video often fall flat on channels like Facebook or Instagram, simply because the newsfeed is geared towards a more casual, “scroll-and-see” viewing experience. The benefit of sharing videos on LinkedIn is that the intent to consume specific types of content is actually there. Afterall, LinkedIn bills itself as “the world’s largest professional network with more than 562 million users.” The nature of this business-focused newsfeed does mean, however, that while your content may resonate more with your target audience, your competition suddenly becomes stiffer. If every business shares the same exact type of video that you’re sharing, suddenly, all the content starts to look the same. 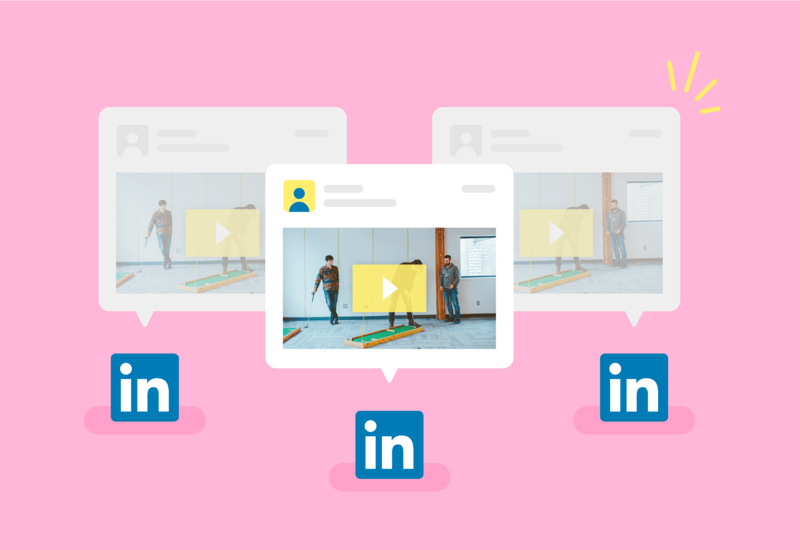 Now that we’ve looked at the history of the platform and have thought through some of the wins and pitfalls of sharing a video on LinkedIn, let’s dive into how marketers can use LinkedIn video to their advantage. Before last year, marketers haven’t really been able to tap into the potential of video on this channel. Sure, you could share a link to your video’s media page, but over time LinkedIn followed suit with Facebook and ended up enforcing a native-upload option for videos if you wanted them to play inline. Given this change (and the fact that social platforms tend to favor native video in the feed) marketers are presented with the opportunity to experiment with how their content might fair in this new world. Lo-fi videos are all you need to get started. Shoot quick, one-off videos while you’re on-the-go at a conference, or use some simple tools to throw together a quick presentation. Brand touches are easier to make. You can easily create a more personal connection with a viewer on LinkedIn than you can on a content-saturated platform like Instagram. Chances are, there aren’t going to be any makeup tutorials or dog videos on your LinkedIn feed (yet), so in theory, it should be easier to cut through that clutter. Your content doesn’t need to have broad appeal. Instead of enticing an entirely new audience that has never heard of your company with a broad, awareness-focused video, think about creating content here that will really strike a chord with a specific persona. In other words, you don’t need to please everyone with your video, just the people that matter. Above and beyond sharing videos natively from your business page, marketers should experiment with video ads on LinkedIn if your budget allows it. Facebook might be cheaper, but it’s starting to reach the point of oversaturation, so LinkedIn could be a great area to explore while it’s still relatively new. With video ads, you can utilize LinkedIn’s audience filtering parameters and then dig into the data to see how folks are reacting to your ads. We chose a specific day and time for folks to post their video on the platform, and from there, we let the views roll in. We tried this out for our recent Video Marketing Week campaign, and we saw a ton of success. In total, we saw over 25,000 views across all videos and got nearly 100 new signups from this LinkedIn video push! For marketers, sharing video on your company’s business page makes a ton of sense. However, salespeople have the liberty to step a bit outside the confines of the brand and get even more creative with video on their personal LinkedIn profiles. Of course, salespeople are an extension of a business' brand, but when you share a video from your own profile, the stakes feel even a little bit lower, which can reduce the barrier to getting started. As a salesperson, it often feels like you’re constantly tasked with breaking common sales misconceptions — yes, there is a real human being on the other end of the line. Video luckily presents a unique opportunity to bring back that personal touch that used to make sales, sales. Those in-person lunches and firm handshakes may be hard to recreate in a digital world, but video can go a long way in leaving your viewer with positive vibes. You’re already a subject expert. Chances are, you know a ton about the product or service your company offers and the industry you’re in, so deciding what type of content to create should be a no-brainer! This expertise puts you in a unique position when it comes to video creation — you’re already attuned to the features and topics your prospects love to talk about, so your chances of posting a video that resonates is that much higher. It helps to put a face to the name. One easy way to get prospects or customers to trust you is to simply show ’em who you are! This not only lends credibility to you and the business you represent, but it also helps build a stronger, more memorable connection. Maybe you’ll end up chatting with a prospect at a conference that recognizes you from a LinkedIn video! It’s great for your own personal brand. While sharing video on LinkedIn is great for business, it also helps you elevate yourself as a sales professional. LinkedIn is a professional networking platform after all, which means you’ve got some added incentive to show your face and flex your skills right there in the form of video. One helpful tip to keep in mind? Be wary of overposting — nothing’s worse than overdoing it. You want to come off as a thought leader in your space, not as a spammy-spammer. Here at Wistia, some folks on our sales team have been using video on their personal profiles to share industry insights or best practices about making video. Katie Morrissey, an account executive on our sales team, regularly shares simple videos that stir up excitement and educate other salespeople on how to use video. Watch this information-packed chat she had with Shannon Cassidy, an SDR on the Wistia sales team. Spoiler alert: there are some helpful sales video tips to be learned from this one! Congrats, you’ve made it to the end of the post! Now it’s really time for the fun stuff. What types of videos should your sales and marketing teams set out to make? Where can you find inspiration? And above all else, how can you make sure you look, sound, and feel your best when it’s time to hit record? We’ve got you covered! Need a little inspiration? Here are 10 foolproof LinkedIn video ideas that you can start experimenting with today! Check out this video that two of our sales team members created to promote an upcoming conference they’ll be attending! Now that you’ve got some ideas in your back pocket, it’s time to actually sit down and press record. Keep these best practices in mind and ensure that your video comes out great every time! Always try to present on a topic you know a lot about. Your authenticity will make all the difference in creating an engaging video. Upload captions to your videos whenever you post them to draw attention to your content in the newsfeed. Luckily, LinkedIn just added this feature to their platform, however you need the .SRT file in order to upload captions. If you’re interviewing someone in your video, always remember to tag them and the company they work for in the post so they can promote the content on their own channel. Keep your energy levels up. Aim to strike the delicate balance between too little energy and too much. You don’t want to come off as disinterested or boring, so try to remember to smile and give each take your all! And as always, if you’re on the hunt for some production tips, check out this in-depth blog post on looking great in your next webcam video. Whether you’re in marketing or sales, video lets you connect with your audience or prospect more effectively — and in a way that’s far more memorable than text. Leverage LinkedIn’s unique business-oriented user base and start experimenting with different types of content to see what sticks. Once you identify what videos brings in the most engagement your business or personal profile, share your learnings with your teammates so you can all succeed with video! Learn everything you need to know about editing videos for social media, from best practices to actually editing a pre-existing video.